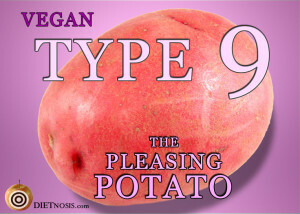 Type Nines go vegan for peace — inner peace. As weight creeps into your body, health problems mount. Even though you try to not think about it or deal with it, you are starting to stand out in a crowd. It is harder to fit in and adapt to situations. You know that you have to change, but you don’t want to have to ask for help from others or burden them with your problems. Realize that there is hope for you by adopting a vegan diet. Weight loss can be achieved simply through eating plants. Peace is possible. Nobody else has to change for you, you simply eat around the meat and eat more salads. You order more side dishes at restaurants. When you cook your own meals you are happy because vegan meals are simple — like stir-fry rice, fruit and granola cereals, or bean tacos. Most vegan foods can be eaten raw or with little food preparation. Often they contain only a few ingredients. Its easy! Just throw a salad together or grab fruit right from the counter. In a pinch there are Amy’s frozen meals because most of them are vegan. Don’t get overwhelmed with the idea of change, just be realistic with yourself. Make small changes and see how you feel. Make a plan that is achievable for yourself. Start by exchanging soda for berry, cucumber, or lime/lemon infused water. Remove saturated (solid) fats by changing to liquid fats derived from vegetables. Decrease your juice consumption because it has the same amount of sugar as sugar. Stop consuming artificial colors, corn syrup, and hydrogenated oils. Start by not eating any meat or dairy before 6 pm if you want to ease into it, or simply cut it out “cold turkey.” Altogether these steps will start you on the path to a healthy and peaceful life. Finally, A vegan diet offers an easiness about your health, a freedom and lightness to your being, to feel young and at peace. You will gain approval of others. 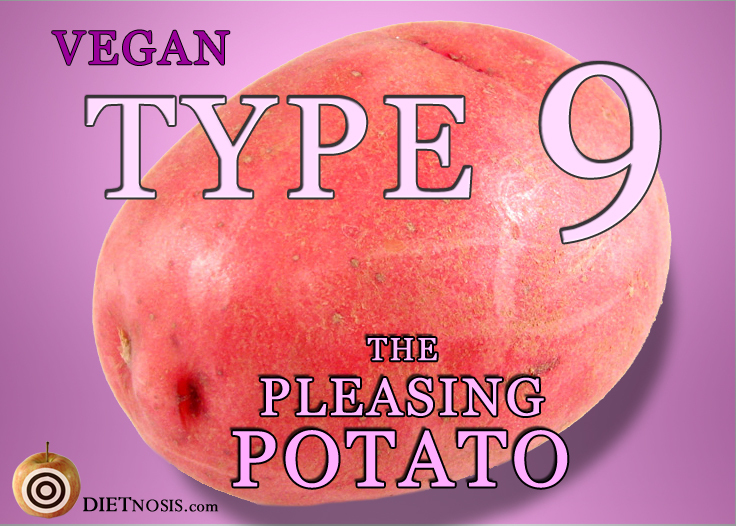 You show how eating a vegan diet is easy and blends well with other eating styles. When you are healthy, you become easy for others to like because you feel good and it shows. You may even gain admirers and more people want to include you in the fun. I want to learn more about Enneagram Type Nine!